Two Russian Air Force planes carrying troops and tons of equipment landed in Venezuela on March 23, reports say. A flight tracking website showed two aircraft left a Russian military base for the Venezuelan capital Caracas on March 22. 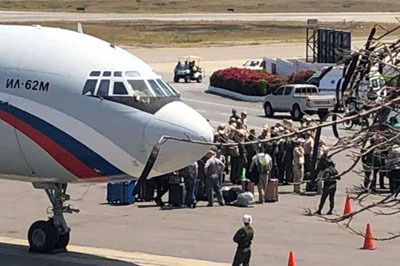 The arrival of the military jets in Venezuela was confirmed by Javier Mayorca, an independent journalist, who said an Antonov-124 cargo plane and a smaller jet touched down late on March 23. Mayorca said approximately 100 soldiers – led by Gen. Vasily Tonkoshkurov, who is head of the Mobilization Directorate of Russia’s armed forces – was also seen, as well as 35 tons of equipment. Russia has strengthened its ties with Venezuela recently as dictator Nicolas Maduro clings to power. U.S. Secretary of State Mike Pompeo, in a March 25 phone call with Russian Foreign Minister Sergei Lavrov, called on Moscow to “cease its unconstructive behavior” in Venezuela. Pompeo “called on Russia to cease its unconstructive behavior and join other nations, including the overwhelming majority of countries in the Western Hemisphere, who seek a better future for the Venezuelan people,” Palladino said. Russia has condemned the U.S. and other foreign powers for backing Guaido. The Kremlin has also opposed moves by the U.S. to impose sanctions on Maduro’s government. Maduro accused the United States of staging a coup against him over efforts to deliver humanitarian aid to his country amid widespread hunger and malnutrition. In April, U.S. sanctions will increase to include a ban on crude imports from Venezuela. Because the U.S. is one of Venezuela’s biggest importers of oil, it is thought the move could cripple the country and ultimately force Maduro out.